From her doorstep, Kirsten Winge can walk right out in the middle of the wilderness of Hedmark county to harvest the best from nature. Back home she writes books about it. She is a biologist who long ago decided to quit her work as a scientist and explore nature up close. Kirsten Winge moved to a place by the lake of Osensjøen, one of the most peaceful parts of Hedmark in Eastern Norway. “It’s quiet here, but you can keep yourself quite busy if you are into tasting local ingredients directly from nature. It’s difficult to imagine a more sustainable activity. I have nowhere else discovered such huge amounts of wild berries, fruits, mushrooms, spices and other natural ingredients, in addition to the game my husband and I are able to hunt”, Kirsten tells. 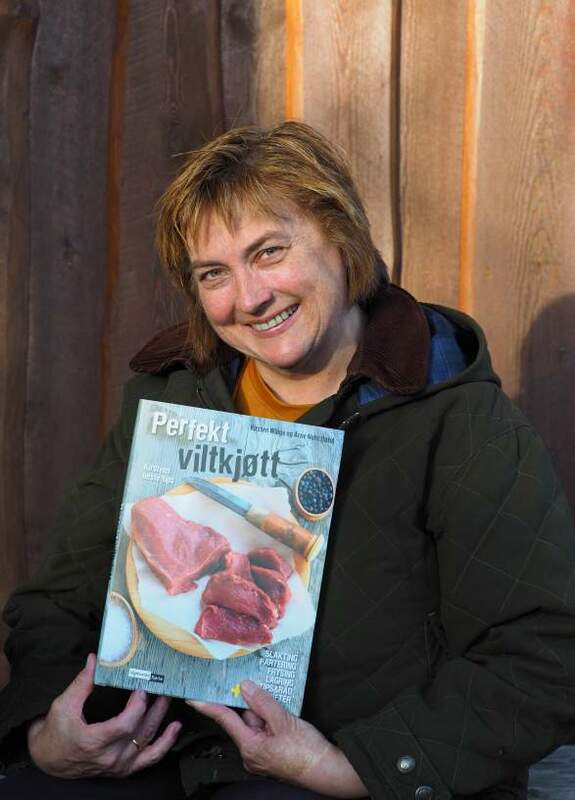 Her deep interest for real-life biology have resulted in the successful books Det smaker av høst (The tastes of autumn) and Den store høsteboka (The big harvesting book) among many other projects that has made her a nationwide authority when it comes to harvesting the natural way. Kirsten's writings about local ingredients and the natural tastes of autumn got a kick-off start when she met a hunter over 20 years ago. Arne Nohr is still her husband and the couple is spending their days in the wilderness harvesting from nature on all levels. “To me harvesting of everything from berries to game, is based on an eternal perspective. I make sure that the quantity I take with me from the forest has not deprived me of the opportunity to do the same next year. One should never become greedy”, Kirsten says. Deer can occasionally be seen outside her kitchen window, moose is everywhere, but statistically more deer are trapped here each autumn. A rich variety of game also include grouse, black grouse and the rarer hazel grouse. One of her favourite meals is roast beef of moose, a three course dinner prepared in an outdoor cooking pit, totally without electricity. Kirsten keeps a well-developed vegetable garden, but her real garden is the immense nature. Last autumn Kirsten and her husband harvested 60 kilos of cloudberries without too much effort. “Before moving out here I usually hiked about 10 kilometres to collect one single kilo, which I at the time thought was worth the effort”, she adds. Kirsten keeps fond memories of her childhood in Trøndelag where she grew up harvesting in the forests with her then retired grandparents who used to move into their cabin during for the whole summer and autumn seasons. “Fruits and berries in Norway have remarkable growth conditions as they are exposed to a lot of sun light during long summer and early autumn days, before they are harvested. I believe our fruit and berries therefore contain more sweetness than in other countries. They also have a thinner peel”, Kirsten explains. Considering Hedmark, Kirsten mentions a bunch of types of berries, like raspberries, lingonberries, blueberries and cloudberries. “And wild strawberries are often possible to find and pick later during summer than in other parts of the country”, she says. The Norwegian word for autumn, "høst", means harvest. September, October and November are the traditional autumn months in Norway. Summer temperatures can last well into September and the snow can set in as early as October. In meteorological terms autumn is the time of the year when the average daily temperature falls between 0 and 10 degrees Celsius. Using this definition, Oslo has 60 days of autumn and Tromsø has 66, according to the encyclopaedia Det store norske leksikon. Another way to mark the start of autumn is The September equinox. In Norway, chances to see the spectacular northern lights increases as the nights gets longer. North of the Arctic Circle the Norwegian "mørketid" (Polar Night) sets in – beginning in November in the northernmost regions. During "mørketiden" the sun never rises above the horizon for several months. Find traditional and new places to eat below. Enjoy the season in stress-free urban surroundings close to nature. Discover autumn’s golden colours – the green way. The “Norwegian foodprints” badge will help you find high-quality Norwegian food made from scratch, and is an easy way to choose local food.